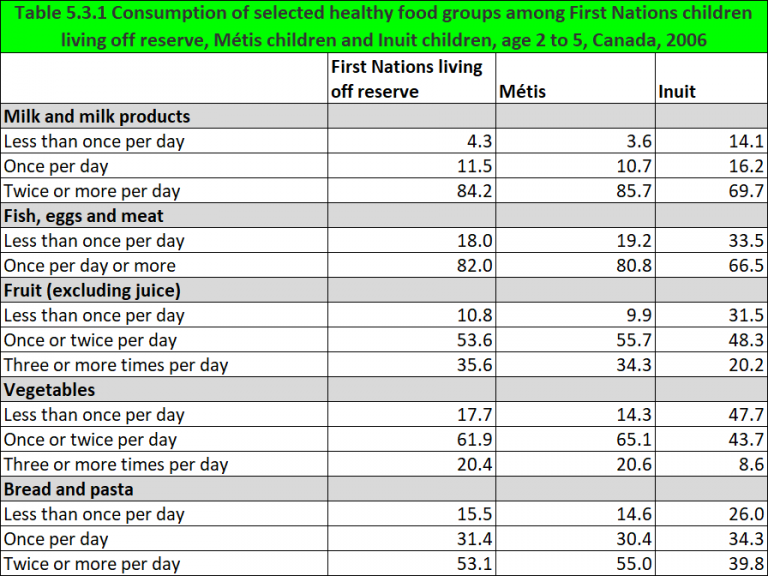 In 2006, over 80% of First Nations children living off reserve and Métis children aged 2 to 5 consumed 2 or more milk products and at least one meat product per day which meets the guidelines. This was less (just under 70%) for Inuit children. In 2006, over 60% of First Nations children living off reserve and Métis children aged 2 to 5 consumed at least one vegetable per day and over 50% consumed at least one fruit product per day. This was slightly less for Inuit children with 48.3% consuming fruit and 43.7% consuming vegetables daily. Just over 20% of First Nations children living off reserve and Métis children and 8.6% of Inuit children ate 3 or more vegetables per day. 1Eating Well with Canada’s Food Guide – First Nations, Inuit and Métis. Health Canada 2007. https://www.canada.ca/en/health-canada/services/food-nutrition/reports-publications/eating-well-canada-food-guide-first-nations-inuit-metis.html-accessed August 10, 2017. Poverty is related to food insecurity. Low-income households often do not have enough money to pay for basic living expenses and it is often the purchase of healthy, nutritious foods that must be sacrificed in order to make ends meet.2 As a result, low-income households are more likely to eat lower cost but less nutritious processed foods and less likely to eat the recommended servings of healthy nutritious foods. The prevalence of food insecurity is very high in Indigenous communities, especially in northern and remote communities where accessing healthy foods can be challenging and costly.3 As a result, they may experience a number of nutritional deficiencies, with impacts on their development. 2Heart and Stroke Foundation. (2017). Position statement – Access to affordable, healthy and nutritious food (“food security”). http://www.heartandstroke.ca/-/media/pdf-files/canada/2017-position-statements/accessto-affordablehealthy-nutritiousfoods-ps-eng.ashx?la=en -accessed September 12, 2017. 3Egeland, G.M., Pacey, A., & Sobol, I. (2010). Food insecurity among Inuit preschoolers: Nunavut Inuit Child Health Survey, 2007-2008. Canadian Medical Association Journal, 182(3), 243-248. Tarasuk, V., Mitchell, A., & Dachner, N. (2016). Household food insecurity in Canada, 2014. Toronto, ON: Research to Identify Policy Options to Reduce Food Insecurity (PROOF).